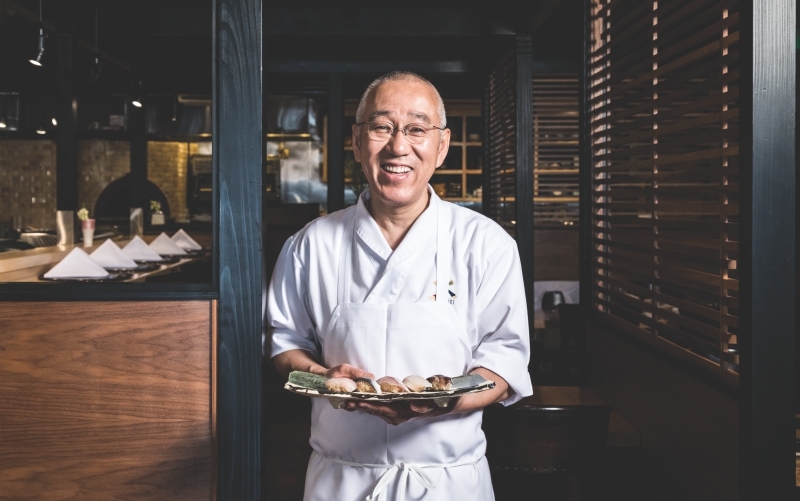 When Mori Onodera opened his restaurant in a squat corner unit along Pico 18 years ago, it was a big moment for the city’s sushi scene. With artwork from recognizable names on the white walls, the minimalist space felt as much like a gallery as it did a sushi counter. The fish was, of course, impeccable: Overnighted from Japan daily by downtown’s International Marine, it was hand-selected in the early morning by Onodera, who grew his own short-grain koshihikari rice in Sacramento to ensure the perfect texture. More often than not you were eating off a glazed ceramic dish thrown by the chef himself, a noted pottery enthusiast. The sushi maker as obsessive perfectionist might seem like a cliché in the post-Jiro Dreams of Sushi era (Onodera trained under Japan’s Jiro Ono early in his career), but at the time the notion of an itamae so laser-focused on the minutiae wasn’t just uncommon—it was groundbreaking. When Onodera quietly slipped into semi-retirement in 2011, selling his sushi shop to a capable apprentice and focusing on pottery making and rice importing, regulars reacted with heartbreak. An omakase meal at Shiki’s wood counter might begin with a few of Sugiyama’s seasonal bites—bamboo shoots stewed for three days, a baby kumquat suspended in gelée—before the focus shifts to sushi: a lozenge of kelp-marinated sea bream; mackerel cured briefly in salt; toothsome geoduck clam with a hit of yuzu zest. It can be tough to describe Onodera’s aesthetic, but the word harmonized leaps to mind. He balances his soy sauce with a blend of sake, seaweed, and a pinch of sugar. The rice, seasoned with a blend of aged vinegars, is kept at body temperature. Strong flavors are softened and deepened; simplicity is crucial. There is no chef in Japan or America making nigiri quite like Mori-san. Could he be the Jiro of L.A.? The Sinatra of shari? Give him a few more decades. Next articleThe Book That Made Me Want to Stay in L.A.